In this day and age, sickness and ill health are part of daily living. Nobody can claim that they have never suffered from ill health – colds and flu are prevalent and the recent ‘swine flu’ pandemic frightened millions and left hundreds feeling unwell. Sickness and ill health can be especially frightening in older people and younger children, whose immune system may not be up to the job of protecting the body from sickness and who may be left with ill health for weeks on end as their bodies try to fight for health. Sadly, in some instances, sickness can leave someone seriously ill. It is in these circumstances that a person may have to be admitted to hospital or to be provided care within the home on a daily basis. Naturally for people in this position, they want to be made as comfortable as possible and likely friends and family too want their loved one to be made as comfortable as possible in their time of need. This is why hospital beds are so important to those who are suffering. Hospital beds provide those who are sick with a comfortable and adaptable solution to feeling comfortable. How are hospital beds adapted for those suffering from illness? Hospital beds have been designed and adapted with people suffering from medical problems specifically in mind. The hospital bed is thus designed to be as comfortable as possible. With most hospital beds, they can be electronically altered to whatever position is most comfortable for the occupant, for instance, this may be lying flat or it may be sitting up. The bed will be able to bend and shape itself to whatever position desired. Hospital beds may also come with a function for raising or lowering the legs for those who have leg injuries or who have been in a hospital bed for long periods of time. Hospital beds also come with adjustable bars at either side of the bed. Not only does this provide support and safety to those who are occupying a bed, they also make transporting the bed from one area to another easier. Is there only one type of hospital bed? 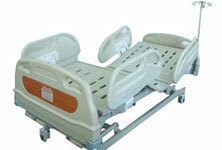 There are many different types of hospital beds, each having been designed with different purposes in mind. For example, a hospital bed for someone who has just had surgery may differ from a hospital bed provided for someone who has a long-term illness. Different types of hospital beds may include the gatch bed, electric bed, stretchers, low beds and low air loss beds, circo-electric beds and clinitron beds. All of these different types of bed have been designed to make those suffering as comfortable as possible. Clearly, hospital beds are vital to all those who are ill or who are suffering with long term problems or who are recovering from surgery. A hospital bed can do wonders for those who are trying to get better and can increase recovery periods for many people.